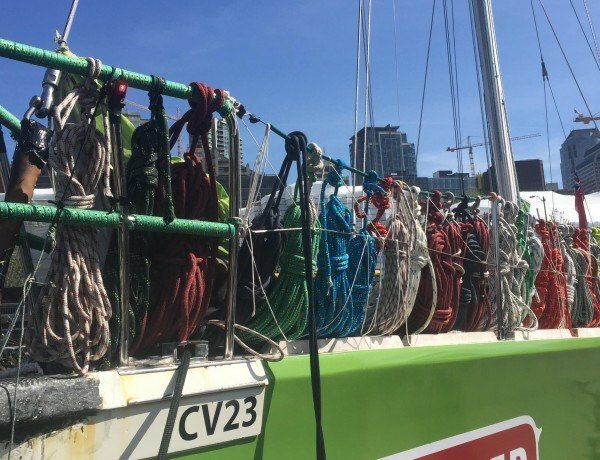 The collection of sailboats in the Clipper Round the World Race at pier 61 in Seattle appeared to be just resting there while the crowds of Seattle goers milled about in the bright warm sun. There were nine of them, with three more due to arrive over the next couple days. The sailors sat in the cockpits or tinkered with gear on and around the boats. To the casual observer, it might look like a relaxing day on the yachts for some well-heeled weekend mariners. But the boats had just come in from China, nearly 6,000 nautical miles across an angry ocean, where stout pieces of hardware had broken, and one person had died along the way. All the boats had set out from London on July 1, 2015 to compete in the ninth Clipper Round the World Race, a brutal competition that lets novice sailors crew aboard 70-foot one design boats, with experienced ocean sailors at the helm. The race is the creation of Sir Robin Knox-Johnson, the first man to complete a solo circumnavigation back in 1968. So while they all look relaxed, it’s fair to say they are, considering where they’ve been. But the sailors are also spending a good amount of time fixing things, refitting, and gearing up for the next leg. It’s probably important here to explain that the stanchion brace, which is a stainless steel post, bolted to the deck, which supports the cable railing known as the lifelines, broke under the relentless lashing of waves. Yes. Water broke the stanchion brace. And still other boats had a tougher time. Two of the boats had their entire helm stations ripped away by crashing waves. These helm stations are stout cages, about chest high, designed to protect whoever is taking a shift at the wheel. They’re made of aluminum tubing about four inches in diameter, and they too are bolted to the deck. Gone. The waves took them. This is the reality of ocean racing. Things get sketchy out there, and relentless waves can only be met with determination and courage. “I was bent over just here, undoing a sail tie when suddenly I was under water up to my legs,” explained Tatham, standing on the foredeck, describing the event as though he were telling you about ta walk to the pub. But the 70-foot boat he’s on is stout and spartan; all business for heavy weather sailing. The boats, called Clipper 70s, are modeled after the thoroughbred Volvo 70s, but they’re built a lot heavier. While a Volvo 70 is 15 tons, the Clippers are 35. They’re built so strong so that they can handle the conditions, and also because most of their crew are novice. By design the boats are safe. And it’s only because the ocean is not. Like any ocean sailor knows, night passages can be especially fabulous and surreal, and Tatham gives a fine description of one. “You’re in just nothing but black, with just one little red light glowing from the compass,” he said. He tells the story of being at the helm in such conditions when suddenly all the resistance in the wheel goes away, revealing the reality that the boat has hit such a speed that the rudder doesn’t necessarily register anymore. And it’s pitch black, you know. “So I’m watching the knot meter climb from 12 to 15 and then up into the 20s,” he said. Down in the nav station, the boat takes on the feel of a spacecraft. The obviously stout walls frame a small room, facing aft and just under the cockpit, where a console of screens gives a complete picture of weather, sea, and global position. It also lets the navigator track the other boats, which of course is key in such a contest. But for all the advanced gear, these boats retain many elements that keep them salty. Instead of roller furling headsails, the boats run old school jibs that need to be bent on using shackles and halyards. Such low-tech appointments also exist in the nav station: An analog barometer, used to read air pressure in order to anticipate wind and storm patterns, is mounted to the wall, and a smiling Londoner with a handlebar mustache called Simon Rosbottom smiles and agrees there can be no improving upon a traditional barometer. This particular crew, explains Tatham, has foregone plumbing in favor of baby wipes. This is to say they’ve ripped out all the plumbing to conserve weight, and clearly because the 24 on board have elected to do so in order to gain an edge. And anyway, when crashing upwind in waves that can rip railings from decks, what good is a proper shower anyway? Sleeping is another story. Each bunk is basically large enough for one adult, with a block and tackle system used to cynch the sleeping sailor up against the hull, lest they are tossed out in the generally unfavorable conditions. Indeed. This is not cruising county. While the mood at the dock is casual and a bit subdued, there’s a reason beyond the rigors of the passage. Each sailor here knows the boat due in tonight, IchorCoal, lost a crew member on the passage. Sara Young, 40, was swept overboard April 1. Another crew member, Andrew Ashman, 49, died on the same boat in September off the coast of Portugal, when he was knocked in the head while adjusting the mainsheet. Both deaths were the first in the history of the race, and both occurred on the same boat. So while the sport is filled with adventure and harrowing tales, it’s also very real out there. The crews head out again April 28 when they sail south for Panama.